Pergola post set in concrete pillars in a pebble and stone yard. After checking your tools, the securing will depend on the kind of terrain where you’re going to secure the posts. This can be either just ground or concrete footing and each one of them has a different approach. Although the majority of pergolas’ posts are nowadays installed upon concrete, there is a considerable number of pergolas that are made and secured on the ground, which needs a different process to achieve it. You have to start by digging holes in the points where you will place the pergola’s posts. 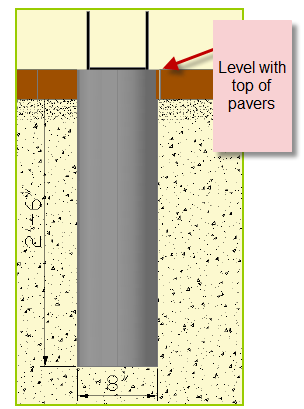 Make said holes with a diameter of at least 12 inches and a depth of a third of the height of the post (for example, if the post is 15 feet tall the holes need to be 5 feet deep). Depending on the average depth of frost in your location the holes may need to be deeper than this number. Once you’ve dug the holes, you need to prepare wet concrete to fill them. You just need to get concrete mix and follow the instructions on the package to make them. With the mix prepared, pour it into the bottom of the post holes. 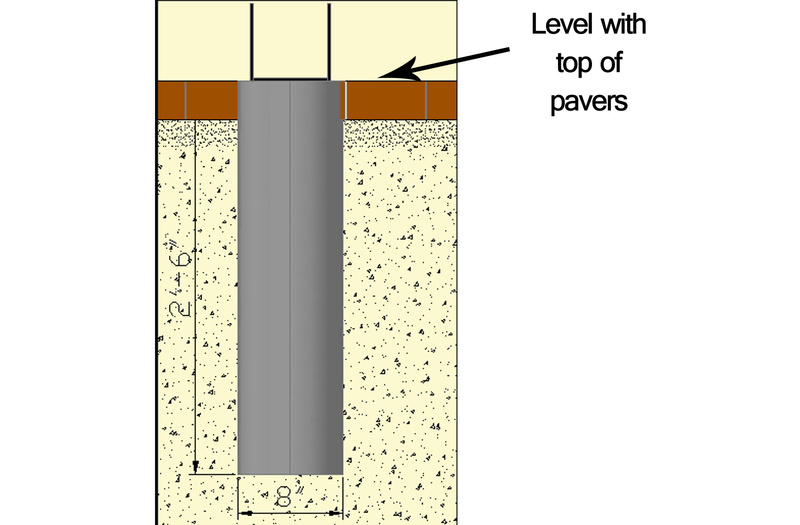 Make it a 4-to-6-inch deep layer on a hole, then stand the post in it and – once it is up – add another 12-inches layer of wet concrete. Align the posts and make sure it is perfectly vertical by using a level. Once you’ve ensured the post is plumb, fill the rest of the post hole and double check it with the level to make sure is still plumb. Do the same process for all the other posts. If possible, before digging any holes, please check with the HOA or local authorities if any pipeline or utility goes underground in order to avoid causing inconveniences to your neighbors. 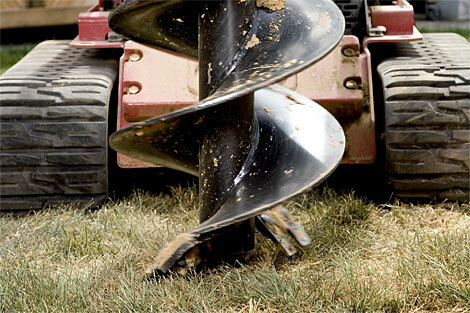 If you want to make the task of digging easier, you may consider renting a gas-powered auger that can be found on almost any tool rental centers. When you’re digging the holes, use a level too to make sure the base of them is plumb too, since it is easy to create an angle at the bottom accidentally. For the vast majority of you, the surface you will be using is a concrete patio slab. Securing a post to concrete is the most common method of installing a pergola. It is also the easiest by far. 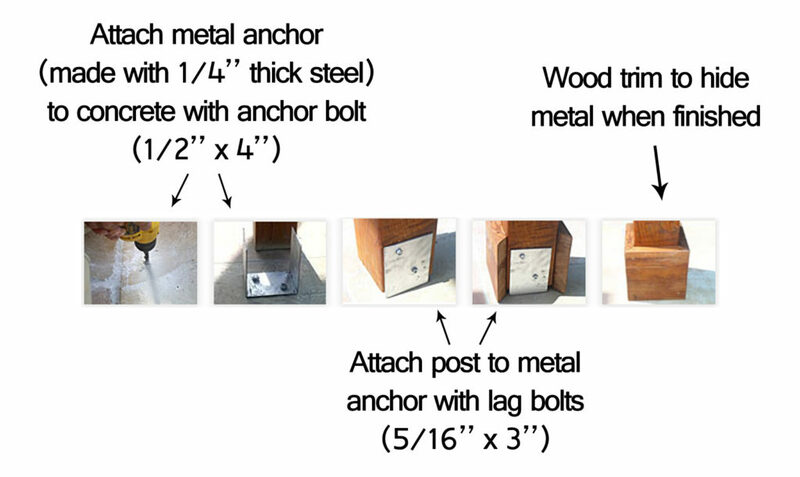 A bracket, a concrete anchor – also known as a Tapcon bolt – and then some lag bolts to attach the post to the bracket. The wood trim nailed on after is probably the most crucial step. In fact, you do see that is what is wrong with the picture above right? NO trim piece to cover the hardware used. Still, other than missing a trim piece this is a great example of what you might need to do. Many modern yards and patios are designed using fancier hard-scaping materials than just concrete slab. River rock, pebbles like those above, stone fragments, brick pieces – there is just dozens of beautiful pieces being put to use to design a low water use yard. Those are much more aesthetically pleasing options, but they are not sufficient surfaces for installing a pergola. You need a surface that is an anchor for a very top-heavy structure that is left open to the elements such as wind, rain, and snow. So – what you do is you remove the pretty pavers and dig a hole to create concrete footings. Then you use the same hardware you would be using if you had an already existing concrete slab and you secure your posts to this much more stable surface. Again though – we recommend for your own yard that you also get some very inexpensive trim pieces to hide the relatively unattractive hardware. It is great that the old pergola in my yard has exposed brackets so that we can show you what it looks like, but you can bet that as soon as I finish re-designing my yard, the new pergola will have a much cleaner look at the base! Trim pieces – a necessity! Yes, the top picture is from my yard but it not ONLY an example of what you should not do in terms of forgetting to use trim pieces. It is also a great example of excellent design. 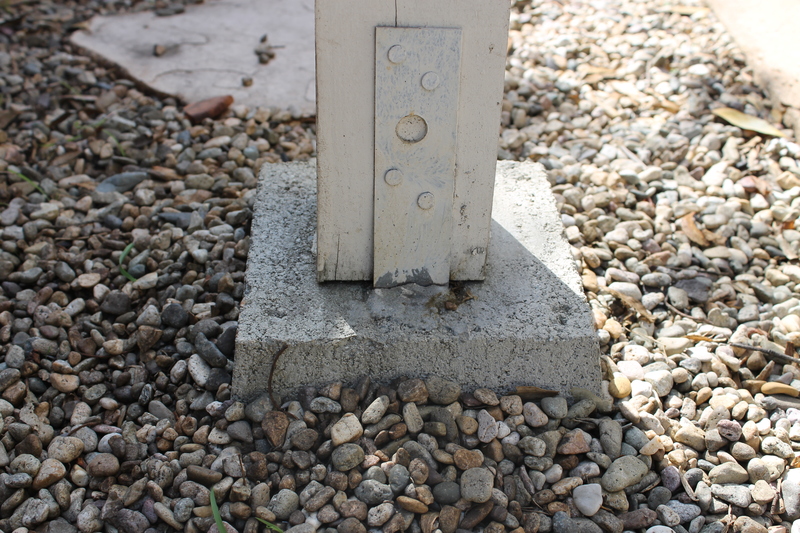 The concrete footings were built up to create a nice square, raised post bases. This keeps them out of any possible standing water. The pergola pictured is an attached design so there are just two posts secured into the ground. It is over 20 years old and other than some neglect and minor termite damage because a previous owner never treated the property on time, it is in excellent shape. There is no sign of shifting or bowing or loss of shape and the posts do not move not matter how hard you lean into them. Sure, it needs a fresh coat of paint, maybe a replacement slat or two and of course – trim pieces – but it is otherwise a keeper. 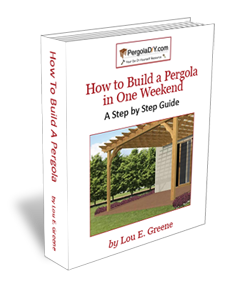 Which just goes to prove that if you build your own pergola using a proper set of step by step illustrated instructions and don’t forget the small details, then you will be enjoying the results of your handy work for decades.